The Guyana Karate College held its first grading examinations for the year, on Wednesday February 28, 2018, under the direction of the Chairman and Chief Instructor of the International Karate Daigaku, Shuseki Shihan Frank Woon-a-tai, 9th Degree Black Belt who was assisted by other senior officials of the Canada headquartered International Karate Daigaku, including Shihan Maureen Woon-a-tai 8th Degree Black Belt, Shihan Bernice Hughes 7th Degree Black Belt and Senior Instructor and Vice Chairman of the Guyana Karate College Shihan Jeffrey Wong 7th Degree Black Belt. Headlining the examinations were teenaged Karate sensation Hannah Farinha from the Marian Academy who earned her third degree black belt or Sandan rank with a scintillating display of martial arts prowess and she was followed by Jonathan Robinson who in a gritty display of karate moved from first degree to second degree black belt or Nidan rank. Angelina Campayne, Jadon Lee, Gavena Doodnauth, Vanita Chulie, Banesha Doodnauth, Jayanti Ram, Najuma Gibbs all had the honour of earning their first degree black belts or Shodan rank after rigorously going through their paces. 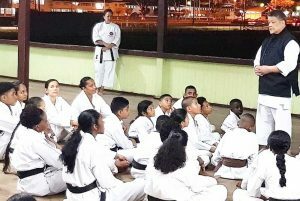 16 of the Karatekas that were graded were from the Guyana Karate College Shakties Dojo – West Coast Demerara, who come under the instruction of Sensei Kenrick Cheeks. Four of these Karatekas earned their Shodan Rank or 1st Degree Black Belt. All five Karatekas from the from the Guyana Karate College Sophia Dojo were extremely successful at their grading examinations as well, one skipping from white belt to orange belt, whilst the other four skipped from orange belts to blue belts. Five senior Black Belt Karatekas successfully sat an Instructors examination as part of their quest to become fully certified International Karate Daigaku Instructors and they were – Kenrick Cheeks, Aliya Wong, Somlata Bispat, William Grant (Sr) and Paula Louis-Grant. Moving from white belts to white with yellow stripes were Amaya Mohamed, Kathleya A. Bacchus, Christian Manohar, Reneeka Laikhraj, Leanne Rodney and Kaiden Bobb. Skipping from white belts to orange belts were Raul Khan, Nicholas Welcome, Sanjana Rupchand and Neil Rafferity. Moving from yellow belts to orange belts were Sarah Maraj, Ethan Muneshwar, Omari John, Aiden Gomes, Naveen Singh, Jared Rahman, Derick Easton, Saffiya Singh, Anushka Singh, Farha McWilfred, Kevin Seokumar, Makayla Sparman and Jonathan Phang. Master Frank Woon-a-tai having a talk with the Karatekas. Promoted from green belts to blue belts were Jared Hurry, Janiya Lee, Justin Persaud, Roy Khadoo, Navita Gunraj, Smriti Devanand and Chitra Persaud. Prosper Jacobs moved from blue belt to purple belt whilst Rehana Bascom skipped from blue belt to brown belt and Jerome Blyden and Lemuel Wilson were promoted from purple belt to brown belt. 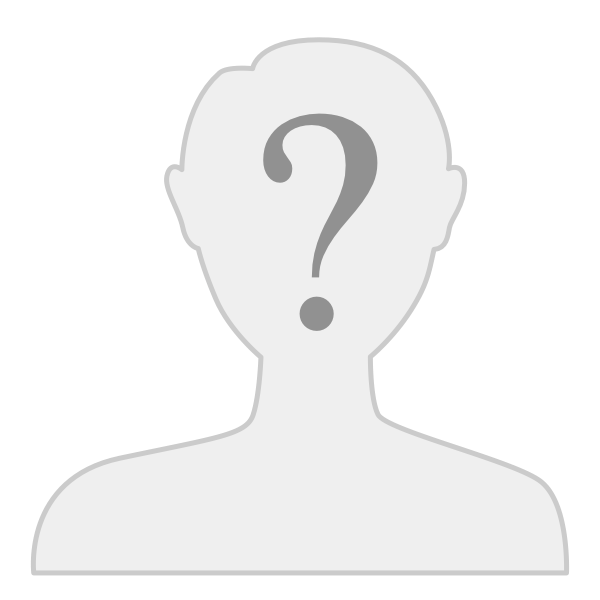 Omar Shariff, Micaiah De Peazer and Sharda Ranglall were promoted from 1st brown belts to 2nd brown belts. Genoveva Buelna skipped from 1st brown belt to 3rd brown belts and Laurence Baptiste, Laurie Baptiste, Randolph Scott, Nathanael Archer, Sarah Persaud and Sharda Persaud moved from 2nd brown belts to 3rd brown belts. 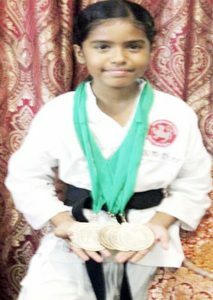 There will be one more grading examination in July of this year before Team GKC departs these shores to represent Guyana at the IKD World Karate Tournament in Barbados in August 2018.